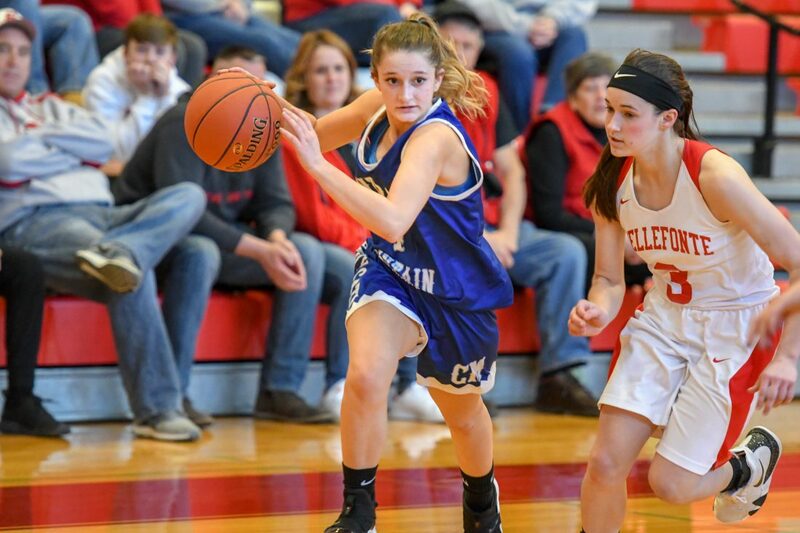 (EXPRESS FILE PHOTO) Central Mountain’s Mia Kopysciansky dribbles the basketball while Bellefonte’s Lily Gardner defends. MILL HALL- Records can be deceiving. In back-to-back seasons the Central Mountain girls basketball team finished with an 0-22 record. But spectators of this year’s Wildcat campaign easily recognized the vast improvement of play, compared with the 2018’s rugged season. The basketball team progressed in the right direction–and it’s evident by the stat sheet. In 2018 the offense mustered 549 points. That figure ballooned to 817 in 2019. And the defense reduced its points allowed by 112 points over the course of the two seasons. Entering the year the Wildcats knew they possessed a difficult road ahead. Central Mountain’s youthfulness mandated the team ignore its record and focus its sight on grasping the game’s fundamentals. “We did not get caught up on winning this year,” Central Mountain coach Scott Baker said. ” Our goal was to make sure that we were better each day, so we tried to win each day. That was really what we tried to do, and I felt that we did that. When reflecting on the season Baker acknowledged a large portion of its struggles were related to the girls’ young age. The team started four underclassmen, who naturally were unable to compete with their physically-mature upperclassmen opponents. Also, CM’s turnover-problem plagued the team all season. The biggest positive he took from the season was the team’s commitment and buy-in of the coaches’ new scheme. Seniors Morgan Wetzel, Summer Flanagan and Katherine Burrows completed their high school basketball careers following a season-ending loss to Bellefonte. The trio of basketball players have endured a lot of losing the past few seasons, but managed to anchor the team from a leadership-standpoint. With the host of returning talent, Baker believes the three girls could be remembered as the senior class who helped rejuvenate the girls basketball program. “We told them we would look at them in terms of not how many games they won, but as a group of three girls who hopefully we’ll be able to look back at someday and say ‘that was a senior class, who despite the fact they didn’t win any games their senior year, they were the beginning of the turning of the corner,'” Baker said. Freshman Mia Kopysciansky and sophomore Avery Baker played pivotal roles for CM this season, despite each having no varsity experience a year ago. Kopysciansky, an 8th grade point guard a year ago, was CM’s floor general and finished third on the team with 6.6 points per game. Avery Baker, who last played two years ago as an 8th grade point guard, led CM with 37 three pointers and was second on the team with 8.2 points per game. The duo, along with sophomores Alyssa Fisher and Quinlynn McCann, are anticipated to highlight a group of talented guards in 2020. Kopysciansky and Avery made the hurdle from 8th grade basketball to varsity starters– a difficult task they handled with maturity. Central Mountain returns four starters in Kopysciansky, Baker, Fisher and McCann. Retaining 80 percent of your starters in any sport bodes well for the future. As with high school athletics the upcoming offseason workouts are optional, but the CM coaching staff will provide the team with open gyms and the opportunity to engage in competitive play. Given many of the girls are multi-sport athletes, it’ll be difficult to have fully-attended workouts. But Baker doesn’t mind the girls being receptive to their respective sports, as the coach knows better athletes equals more wins.